It was one of those mornings where you’d rather go back to bed. 50 degrees, cloudy skies, just enough rain to be annoying, Welcome to October in Cleveland. At least, we were going to the West Side Market but there would be a few stops along the way. First, Bill and I had to navigate through downtown Cleveland. I know that seems like an easy task but keep in mind Bill doesn’t have a car so driving routes aren’t his specialty. Second, we were in dire need of lunch. Bier Markt was just down the street from the West Side Market, but since we had eaten at McNulty’s Bier Markt just the night before that was out of the question. 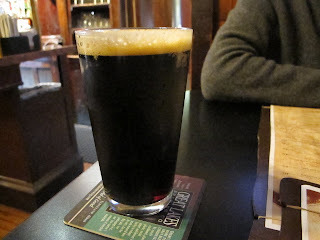 So Bill suggested another beer centric location, the brewpub at the Great Lakes Brewing Company. I love the concept of a brewpub. In theory you bring together all the beers of the company, use them in the creation of some quality food and everyone is happy. Well, that’s the theory behind it. At the very least, the meal would start with a tasty beer. 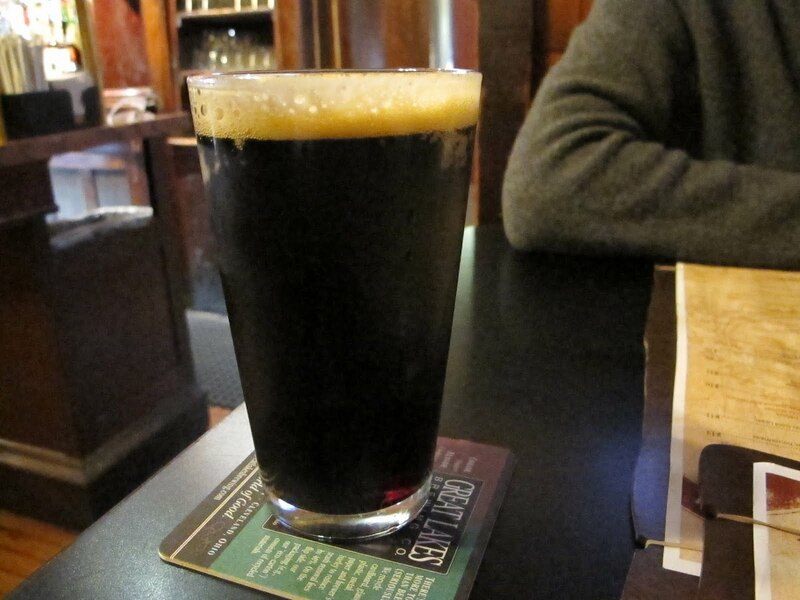 That’s a pint of Edmund Fitzgerald Porter, not too shabby. 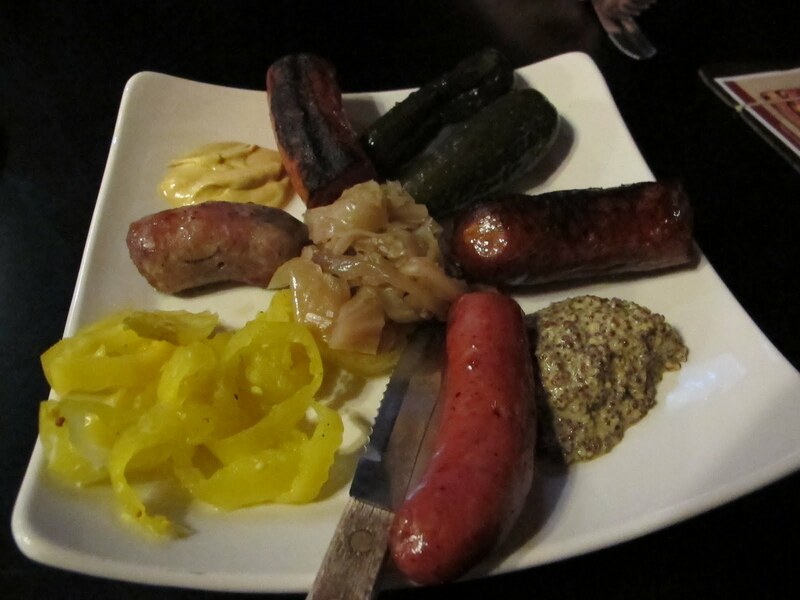 What better to accompany our beer than an appetizer of sausage? This was the Sausage Sampler and a rather interesting selection. 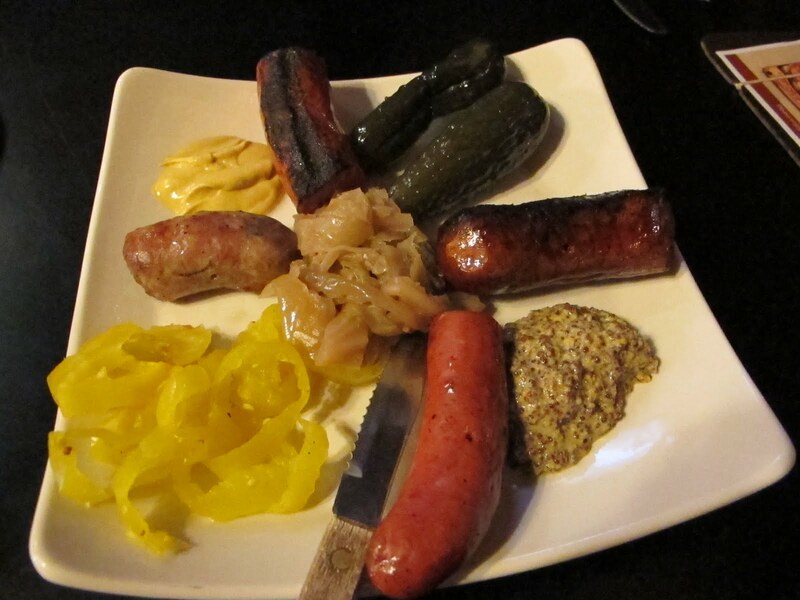 Going clockwise, there was an Italian sausage at the top, then a Bratwurst, next a Hungarian Hot, and lastly an Andouille and it was a mixed bag with this plate. The Hungarian Hot was an immediate favorite with a quiet paprika heat that went perfectly with mustard. 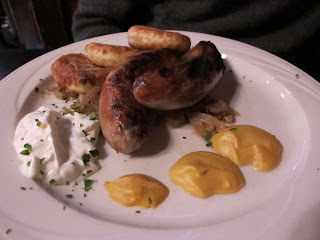 The Bratwurst was in much the same vein, very porky and great with both mustards. It was with the Andouille that the wheels began to fall off this cart. There was no smoky flavor to the meat despite the sausage being burnt to a crisp. Also missing was the multitude of flavors you get with a quality Andouille sausage. I realize I have high expectations for a Louisiana favorite but this was crap. The Italian was much the same. There wasn’t any fennel or chili in the sausage; it was just a tube of emulsified meat. On the plus side, the pickles tasted like they had been brined in an apple cider mix and they were excellent. From the moment we stepped in the door, Bill had his heart set on the Bratwurst and Pierogi entrée. 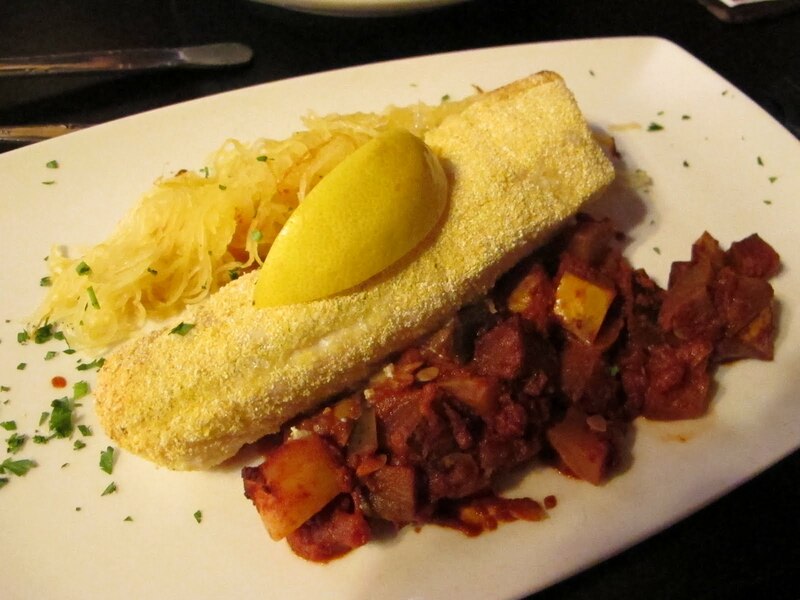 Hoping to avoid an all sausage meal, I went with Bill’s alternative suggestion, the Pan Fried Walleye. It will be a long time before I let Bill forget this meal. This was a terrible piece of fish. With nothing but a simple cornmeal crust and a trip through a pan full of hot oil, there was nothing standing between me and the walleye, no salt, no pepper, nothing. Even with a liberal dose of salt, pepper, and lemon this was a juicy but incredibly bland fish. On the other side of the table, Bill’s dish of Bratwursts and Pierogi was looking pretty appetizing. Being the ever generous gentleman, Bill was more than happy to let me try some of his plate. The pierogi were doughy but quite tasty. Each bite was full of a pillow like potato goodness and they were magic with sour cream. The bratwurst was much like the one on the appetizer, simple, made with a good casing, well cooked, and dynamite with mustard. If there’s a lesson to be learned here, it’s to stick to the basic combinations in life, the ones that we are sure will work. Beer and sausage, an out of this world combination that eclipses the mighty tag team of beer and pretzels. Actually, this story takes place in the Midwest, home to a multitude of Friday Fish Frys that are always well lubricated with beer. There is no lesson here. At the Great Lakes Brewpub, you can rely on very few things: quality beer, good bratwurst, and good pierogi. Everything else I tried was pretty damn poor. If there was one bright side, the sub par lunch left plenty of room for jerky from Czuchraj Meats.